Glenbarrow is the source of the River Barrow in the Slieve Bloom mountains, Co. Laois. 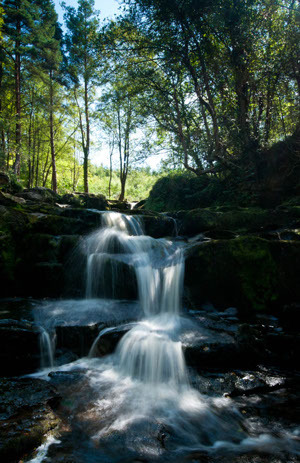 It is one of the most scenic parts of the Slieve Bloom area with its waterfalls and steep valley. The area is very remote and offers the visitor peace and tranquility. The only sounds to be heard are the crash of the waterfalls and the fast flowing Barrow. Natural and artificial waterfalls occur along the river. The area was extensively quarried back in the 1800’s. In fact the river was more than likely diverted at one stage in order to quarry the sandstone. There are still many signs of the quarrying activities evident today, no more so than the exposed bedrock of the red sandstone and the holes where explosives were placed. The Clamp Hole Waterfall is a good example of the waterfalls that occur in the area. The valley which the Barrow flows through is a good example of a glacial moraine. The Barrow has cut it’s way through it and hence the steep slopes of gravel are evident on the sides of the valleys. Sometimes these slopes collapse and expose the gravel underneath. Due to the make up of the geology, Glenbarrow has a wide diversity of plants. Apart from the usual forest plant species such as ferns, mosses, heathers, shrubs there are many orchids on the slopes of the valleys. The area is also very rich with animal life. There are hares, foxes, badgers, fallow deer and many bird species present. Glenbarrow is a unique forest setting with a beautiful riverside walk. Therefore the terrain can be rough in parts and sometimes wet underfoot so be prepared with appropriate clothing and footwear. Glenbarrow is one of five EcoWalks that the Slieve Bloom Rural Development Society have established. The Eco walk consists of 10 stops which are identified by sequential numbers. Stops here include the waterfalls, Glenbarrow homestead, the ridge of Capard, the quarry and many more interesting points. A waterfall in Glenbarrow Eco Park. The internet has become the home of thousands upon thousands of companies selling Hublot replica watches which makes tag heuer replica rather impossible to inspect anything you purchase beforehand. Not that you must inspect a rolex replica before you buy but it certainly doesn't hurt because even in a replica rolex replica sale matters. Simple things like, does it have changeable batteries or is hublot replica simply a toy knockoff of the original is difficult to discern in a picture. Hublot replica watches today. While inspecting a prospective replica you should verify that brand names are actually spelled correctly. An example of this often occurs in knockoff bags, purses or shoes or rolex replica. Another thing to remember before purchasing a Hublot Big Bang replica watch is this: Are you or will you be comfortable enough, in your own skin, to wear such a replica watches uk when friends, family or colleagues realize that it.